Face of Avon: A Lipstick Trick Guaranteed To Put You In A Happy Mood! A Lipstick Trick Guaranteed To Put You In A Happy Mood! Rub on a layer of moisturizing balm and use an eyebrow brush to gently slough off dry skin. Add concealer to the outer corners of your mouth before applying lipstick, “This is a spot where color tends to bleed,” she says. Make ‘em kiss-proof by filling in lips with liner. 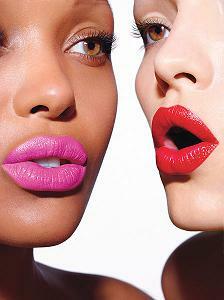 Then apply lipstick, blot, and add another layer of color. For more staying power, cover with a thin layer of tissue and dust translucent powder on top. Get perfect edges using a lip brush. Start at the outer corners on both top and bottom and work your way into the center using one fluid motion. Erase mistakes by tracing along the outside of the lip line with a small, stiff brush dipped in foundation. To fake a fuller pout, add a dot of silver or gold shadow above the middle of your lips and stick to glossier textures. Don’t overload on color everywhere—if you’re wearing a vibrant shade all you need is mascara, she adds. Got any other tips for pulling off bright lips? Have a favorite shade? We know you shouldn’t kiss and tell, but we promise your beauty secrets are safe with us!